I got a chance to take my Robou saw out for a ride. First I tried it out on a couple of practice boards. The first step was to use my kerfing plane to create a nice deep kerf for the saw to track in. 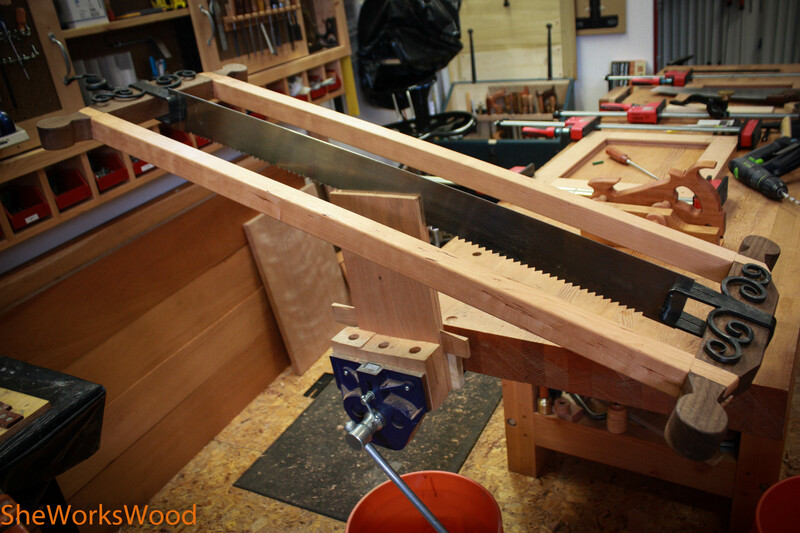 The saw takes some getting used to and it worked best for the board to be in the vise at the side of the workbench instead of the end of the bench. Sawing will push the bench around if there isn’t enough weight. After a couple of practice runs, I was able to saw the panel for the door in half. Its beautiful cherry panel and I can’t wait to see it in the door. And the resaw was way less stressful than doing it on the bandsaw. I kerfed a practice board. The saw took some time to figure out. And now for the door panel. This entry was posted in door, TV Lift Cabinet and tagged curly cherry, robou saaw, TV Lift Cabinet. Bookmark the permalink. It is absolutely crazy, but I like it! That saw is absolutely crazy. I don’t know that I’d ever feel the urge to resaw by hand but I still want to make a saw like that! Did you make the kerning plane too? I worked up a sweat using it but the saw works really well so it was totaly worth the effort. Yes, I made the kerfing plan over the summer and had a lot of fun making that too. No wonder its taking so long to finish the TV Lift cabinet .. all these little projects. Eww! Yes, I probably could. I’d have practice a bit more, but I might if I had a need for wide veneer. For smaller widths I will probably use my band saw. Hopefully early next year, I’ll be working on a Morris chair project and the arms have bent lamentations. That also might be a good candidate. I’ll bet it was hard work – those things were (are) used in tandem, double handed! You’ll have muscles like Arnie in a minute! I was wondering how wide the kerfs are that are made by the Kerfing plane and the Robou saw. 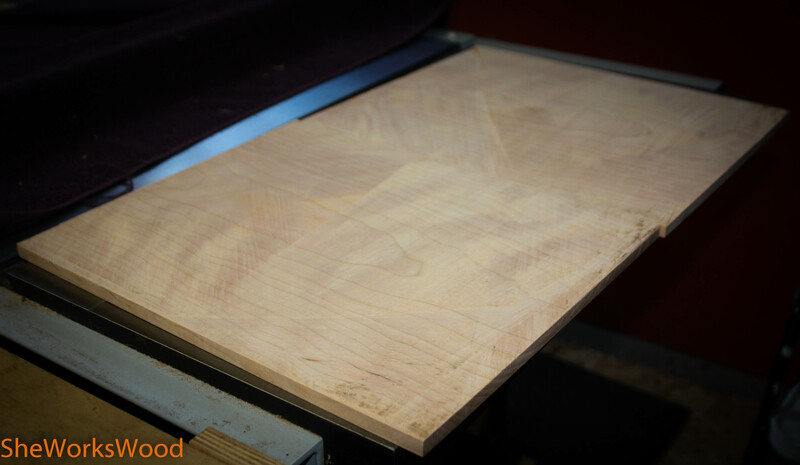 How much thickness of the board do you loose due to the kerf, blade wander, and cleanup of the sawn faces? How much better is the Robou saw over a well sharpened coarse rip handsaw. Well, the Robou saw is much faster than my rip panel saw. The teeth on the Robou are, according to the Blackburn Tool web page, 0.042″ thick 3 1/3 points per inch (2 1/3 teeth per inch). I’m sure that Mark at Badaxe could tell you what the blade thickness is for the Kerfing plane (I didn’t readily see that information on the site). 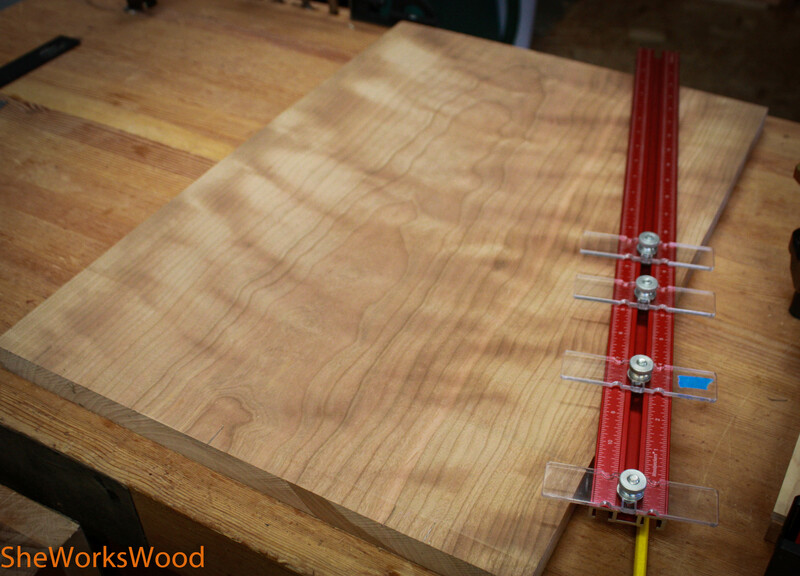 However, I didn’t loose a lot of thickness in the resaw. I had a board (S4S) that was just under an inch and I should be able to get easily 1/4″ if not closer to 3/8″ when I’m done. Great work Marilyn. Is that the Cherry board I sent you a while back? Anyway I hope you will keep using this saw, you might be surprised how little you will reach for the bandsaw anymore. I realize my bandsaw wasn’t the most powerful, but I can easily outpace my old Grizzly 14″ with this saw. Though I use the 48″ much more than the 36″ so that will certainly contribute to the speed. I’m anxious to carve out some time and make the kerfing plane and see how that changes my process too. This one’s a new board I picked up on my visit to a lumber yard just outside of Portland. My guess that I will tend to use this method more than not. It certainly has a more predictable outcome than the bandsaw and, once you take all the set up etc into consideration, it not that much more time. 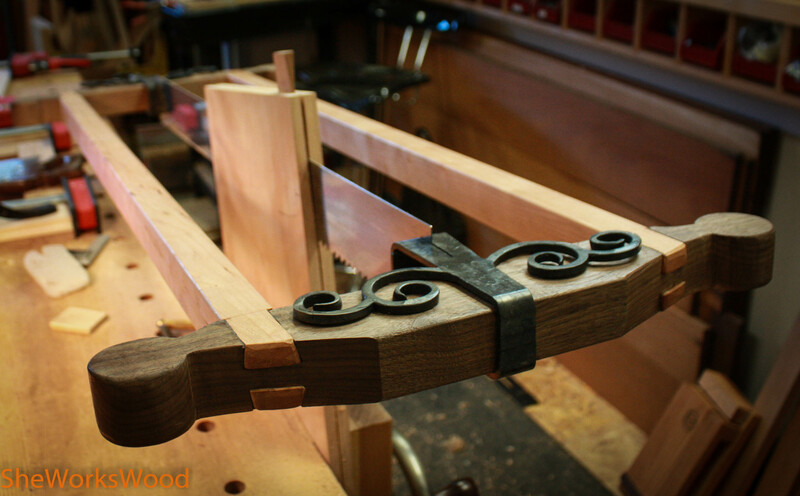 I notice that the joints joining your rails to the cross pieces aren’t made using the same joint as Tom Fidgen. What made you change? I made the Roubo version of the saw (Shannon Roger’s design) not Tom’s version. Ah, I see. 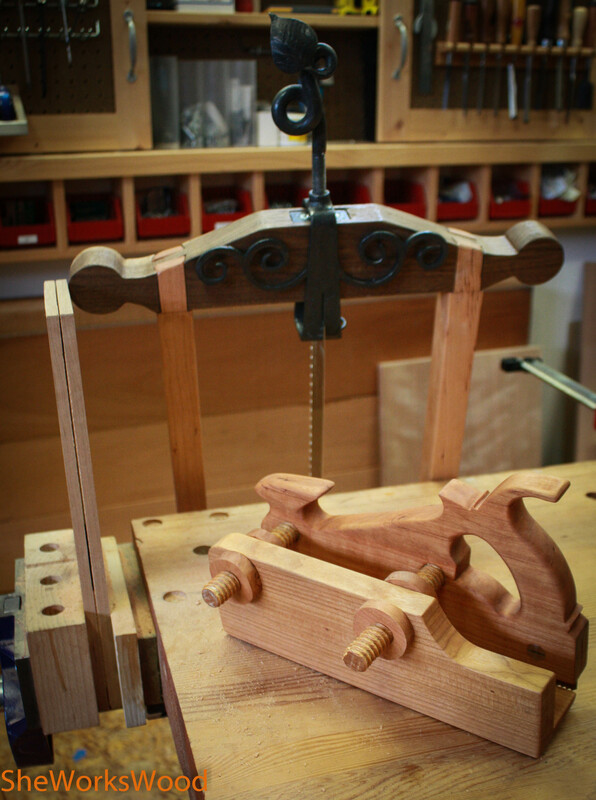 Good choice – Tom’s short grain double tenon is (to be kind) “surprising”, since the wall between the two mortises is short grain, and absurdly weak. You may have already seen this, but I’ll include it anyway; Mike Siemsen made a nice frame saw. Eww! Thanks! I hadn’t seen it.